Kitchen and individual bathroom in kitnets. With swimming pool for adults and for children. We are located 4 blocks from the ocean and 5 blocks from the boguacu river. Kitnet Guaratuba has 04 kitnet's that accommodate 08 people in each. And 04 kitnet's that accommodate a couple and two children in each one. All the kitnet's have individually refrigerator, stove, sink, kitchen utensils, tv, fan and individual bathroom. Covered garage, barbecue, play graud for children and a Snook table that can be used at no additional cost. We are close to the Little Price market, pharmacy, snack bars, restaurant, pizzeria and ice cream shops are close to Kitnet Guaratuba. It is necessary to bring bed linen and bath and personal hygiene. All Kitnets have individual bathrooms. There is one bathroom outside kitent which can also be used. Best value in Guaratuba. You will have unforgettable moments, enjoying nature with safety and comfort. Kitinetes bem confortável para passar com a família. (041) 997981083 Kitnet Guaratuba offers bicycle rental and kayak trips in the Boguaçu Rivers (150 meters away) or the Saí Guaçu River (4km away). For the kayak tour is neccessary in advance. The kayak tour has a capacity for 8 people, for the tour this included instructor guidance and accompaniment, in addition to all the safety equipment that the sport requires. In the river tour Boguaçu is possible to visit an island of sambaqui which is an ancient deposit consisting of shells, kitchen scraps and human skeletons accumulated by indigenous tribes that abitavam the coast. Natal, ano novo e carnaval só com pacotes de dias. Natal mínimo 500 reais para duas noites. Ano novo mínimo 3 noites por 1mil. 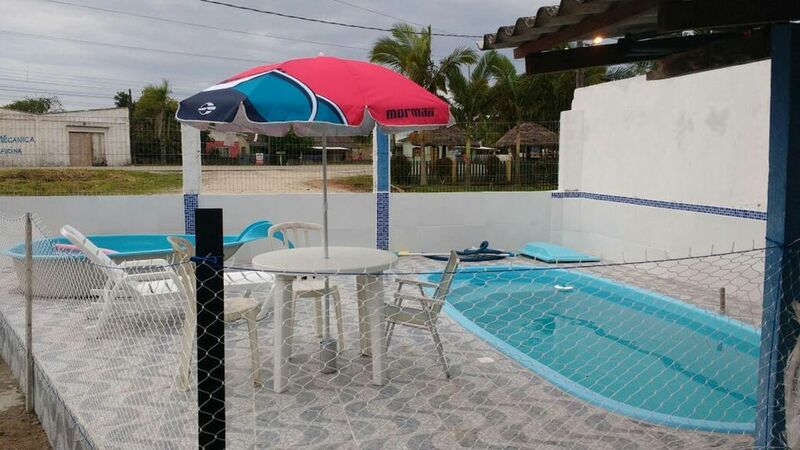 Carnaval mínimo 3 noites por 700 reais. Para casal e duas crianças (kitnet pequena para 4 pessoas). Para kitnet que cabe ate 8 pessoas fica assim determinado: Natal 2 noites 800 reais, ano novo 3 noites por 2 mil, carnaval 3 noites por 1500.